In heavy bottomed saucepan bring 4 cups water to a boil. Add the rice and quinoa mixture and reduce heat to low, cover and slowly simmer for 25 minutes or until water is absorbed. Turn off heat and leave lid on for 10 min to steam. In the meantime mix together nutritional yeast, flour, onion flakes, garlic powder, salt, turmeric, sugar and jalepeno powder. When thoroughly combined slowly add the remaining 2 cups water and mix well until dry and wet ingredients are well mixed with no lumps. Turn on the heat to medium and bring to a boil, stirring frequently. Turn heat to low when boiling occurs, stirring constantly for about 5 more minutes or until the sauce has a thick, smooth, melted cheese consistency. 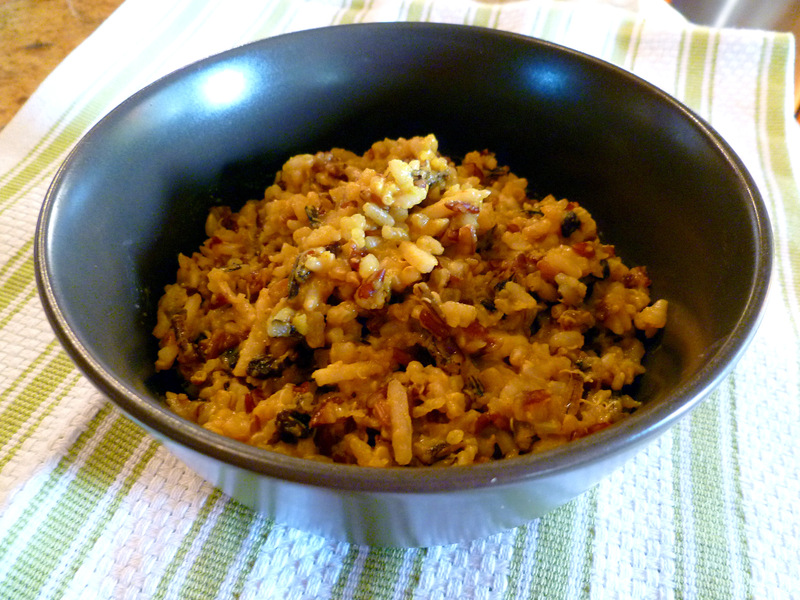 Fluff rice mixure with a fork then add the cheese sauce, currants and almonds. Mix well then serve immediately. If you don’t have the TruRoots blend, you can use any type of rice cooked to package instructions or a sprouted brown rice with your favorite quinoa. Just be careful because sprouted brown rice and quinoa have similar cook times but regular brown rice will take longer. Don’t combine regular brown rice with quinoa as the quinoa will be overcooked.